Hi, I have three wave x, y (for 1d plotting) and index wave. I would like to do 'display y vs x' with line (not scatter). is there any way to do this without splitting x and y wave? The way I'm reading your question, display ywave vs xwave and ModifyGraph mode=0 will give a line through your xy coords. So, I guess you mean something else? What do you want to do with the index wave? 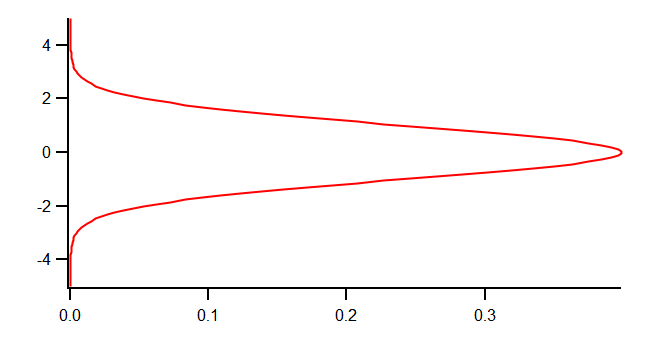 s=0: Normal orientation of X and Y coordinates. s=1: Swap X and Y values to plot Y coordinates versus the horizontal axes and X coordinates versus the vertical axes. The effect is similar to mirroring the graph about the lower-left to upper-right diagonal. This will allow you to have only yWave plotted with lines between points and not having to create a separate x wave. Note that this option is global for all elements in the current graph, so if you want to add another axis with "normal" behavior, you need to put this into a sub-window. Note that you can do Display/VERT or AppendToGraph/VERT to get the effect of SwapXY applied to a single trace. I can't tell if this actually solves the OP's problem, though.